Losing your teeth is not something that most people normally enjoy. You end up having a gaping hole in your mouth that not just affects the chewing functions of your mouth, but also affects your smile. No one wants to smile with an empty space in their teeth. If you want to get rid of this problem, the best solution for you is dental implants. A dental implant can be called a fake tooth that is planted inside your gum to fill up the empty space left by the extracted or removed tooth. The way it works is via a titanium pin which is inserted into the open gum. The pin acts as an anchor for the new artificial tooth. Once the pin has linked firmly with your gum, the tooth is planted onto it. It’s a procedure that can spread over months depending on how many implants you need. First, the gum is exposed and the pin inserted into it. The pin is allowed to join in with the gums before the artificial tooth can be placed onto it. Once the tooth has been attached, it becomes a part of your jaw since the artificial teeth are created to fit into the exposed space. Since it acts like a regular tooth, you need to take care of it like one as well. Not only will dental implants restore the function of your mouth, but it will also help improve your appearance. A complete set of pearly whites helps you feel better about yourself, after all. Post-treatment, you’ll see yourself smiling more. Dental implants are more convenient and durable than other options. For instance, they’re better than bridges because no teeth need to be moved or altered to place a new tooth. Thus, your other teeth won’t be affected. Implants are more comfortable to wear and speak with; poor-fitting dentures, on the other hand, slur your speech and make chewing difficult. Dental implants are a durable investment. If you take good care of them, they could last a lifetime. Dental plants are titanium posts anchored into the jawbone. 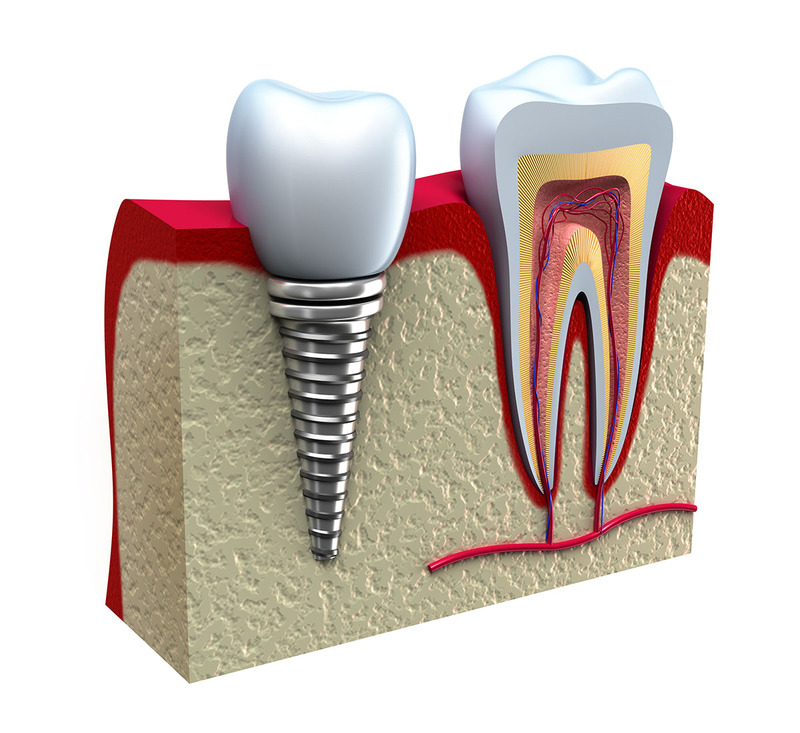 The entire implant process is performed over the course of a few months. In the first part of the process, the dentist installs the implant itself, where a screw is placed into the jawbone. An incision is made in the gum so that the implant can be inserted. Multiple implants can be placed at once if necessary. After the implants are placed, the gums are sutured. The implant must be allowed about 3-6 months to heal, and during this time, the jawbone will form around the implant in a process called osseointegration. During this time, you can have temporary crowns installed so that you can eat and speak normally and maintain a proper appearance for your smile. After the implant has healed, it is time to place an abutment on the implant. The abutment serves as the base for your new tooth. Once this is placed, an impression of the abutment is taken and is used to create your permanent restoration. Some offices have an onsite lab to create the crown, but others will have to send it to an outside lab. Once the restoration is completed, you can return to the office to attach the restoration permanently. Your smile will look just like it used to, and after a short period of getting used to the implant, it will feel just like one of your own teeth. Once you have dental implants, you must not take your dental health for granted. They need proper oral hygiene and care to last. This includes brushing and flossing regularly to avoid dental infections. You may also need additional cleaning aids. Our dentists will help you care for your dental implants by providing professional services and advice. If you’re looking for dental implants in Old Bridge, NJ, look no further than Midjersey Smiles. Our competent dentists will determine if you’re a good candidate for the treatment and prescribe the best course of action for your case. We will provide you with great dental care as we restore the function of your mouth and the beauty of your smile. For the best dental implants that not just take care of the exposed space but make sure that you don’t end up with one again, visit your dentist in Old Bridge, NJ, Midjersey Smiles, for consultancy. Our dental implants in Old Bridge, New Jersey are a permanent and appealing solution to replace missing or extracted teeth. Designed to fuse with the bone, dental implants replace your tooth’s roots and provide a sturdy foundation for teeth replacements, like dental crowns. Schedule a consultation with us and learn more about our dental implants.